Question: Should You Buy a Home With Popcorn Ceilings? "After looking at what seems like hundreds of homes that we can not afford, my husband and I finally found our dream home. The home is within our budget, and it's located in a good school district, which is very important to me. Everything about this home is perfect except for one thing. It has popcorn ceilings. My husband says that popcorn ceilings are no big deal, but what would he know? He smokes like a chimney and shows no signs of stopping. He says a popcorn ceiling with asbestos won't kill him any faster. What do you think? We have twin girls who are not yet three. Should we buy a home with popcorn ceilings?" Answer: I hate to say this, but when it comes to popcorn ceilings, your husband is partially correct. Whether you call them popcorn ceilings, acoustic ceilings, or textured ceilings, it's all the same type of cottage cheesy ceiling. That bumpy stuff stuck to the ceiling. If you're really unlucky, some popcorn ceilings have embedded those 1970-era sparkles. This reminds me of my neighbor who could not sell her home. She asked me what she could do to improve her odds of selling. I suggested she remove the popcorn ceiling. This was something that had not occurred to her. After the workers scraped away the mess, it revealed a beautiful plaster ceiling perfectly intact. My neighbor liked it so much that she decided not to sell after all. The project encouraged her to tackle other home improvement projects. Many homes built in the late 1930s through the 1990s have popcorn ceilings or some type of texture applied to the ceilings. This was before the government discovered that asbestos was a bad thing. According to the EPA, the use of asbestos in textured ceiling paint was banned in 1977. Inhaled in large quantities, asbestos fibers can cause lung disease, scarring of the lungs and lung cancer. However, not all popcorn ceilings contain asbestos. Moreover, if left undisturbed or contained, asbestos is not dangerous but many people still don't want it present in their home. You might be wondering why would anybody spray a ceiling to start with? I suspect in part it's because they did not want to finish the ceiling or could not conceal imperfections. Sometimes, a popcorn ceiling covers up a bad drywall and mudding job. That's because mudding (applying joint compound) a ceiling is an art. Not every contractor or homeowner turned weekend warrior is an artist. It was also trendy at the time. You could leave the popcorn ceiling and contain it by painting it, or you could remove it. It's not that expensive to remove, so I would not refuse to buy a home just because it has popcorn ceilings. You can fix that problem relatively easily. Don plastic gloves to avoid contact with the sample. Fill a spray bottle with a teaspoon of soap and 16 ounces of water. Spray a small area to dampen the ceiling. Use a sharp razor-blade knife, cut out a sample and seal it in the container. Mail your sample to the lab and wait about a week for the results. It might not matter to your husband whether the product is dangerous. However, inhaling almost any type of building material is not exactly healthful. If you both choose to bypass the test but still remove the popcorn ceiling, it would be wise to hire a professional to do the job. Some people prefer to do the job themselves. If so, you should take precautions. To be safe, the pros recommend that you wear a respiratory mask. Do not expose body parts to the texture in the ceiling. Wear a long shirt and pants. Cover your feet, your hands, and your head. Because no matter how careful you are, the stuff will fall on you. That's because you are located below falling material. If you have pets, relocate them to another room. Pets and home remodeling don't always go hand in hand. Especially cats. They are curious creatures and end up stepping in stuff and tracking it all over the house. You don't want to give your cat a bath. Nooo. Cover the flooring. If you use a plastic sheeting, you could slip and lose your footing. I recommend those large brown rolls of packing paper. Toss drop cloths and cover those with brown paper. That way, when the mess falls on the paper, you can roll it up to discard it. You can use a garden hose set to a mist option to dampen the ceiling. Work in small areas at a time. Use a push pole with a blade to scrape the ceiling. This is easier from the floor than walking up and down a ladder to scrape by hand. Do not stand directly under falling plaster. After the ceiling dries, fill gouges or holes with joint compound, let it dry, then sand. It may require several coats of joint compound to achieve a smooth finish. 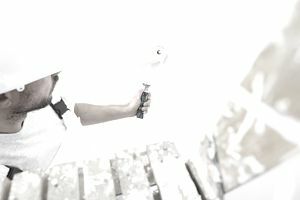 If you are unhappy with your abilities to finish the ceiling, at this point, you could always hire a drywall expert to finish the last coat of mud.